High speed trains now run from St Pancras station to Ashford International and take just 37 minutes. Change at Ashford International for a train to Rye (18 minutes). 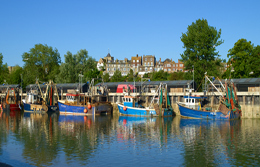 Rye is situated on the A259 between Hastings to the west and Folkestone to the east and on the A268 from the north. Visit www.theaa.co.uk for a detailed route planner to Rye from your starting destination. From London/M25 Anti-Clockwise south past the M3 head to M25 J5 then take the A21 south to the Flimwell traffic lights where you turn left, stay on this road for 16 miles and you will arrive in Rye. Upon arrival in Rye, there are many car parks such as follow signs to Rye’s main visitor car park, Gibbet Marsh (210 spaces).